As you move through life, it is common for one to begin to collect things. Whether its records, stamps or what have you, everyone's got something. 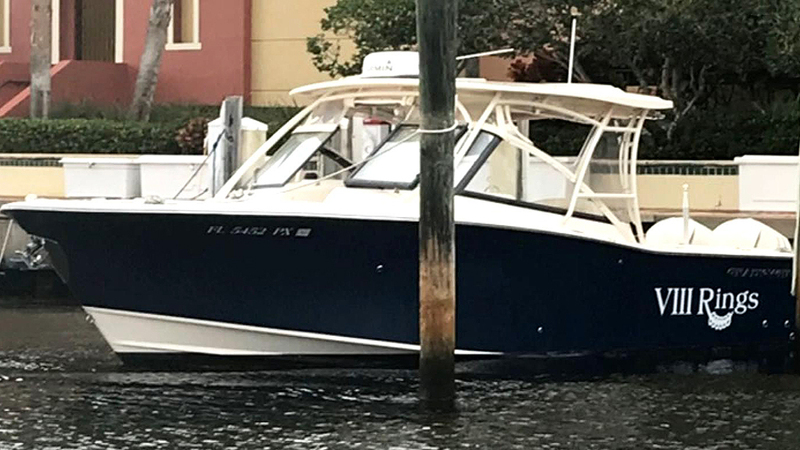 Bill Belichick has this knack for collecting Super Bowl rings every now and again, and you can tell by the name of his boat. Belichick's boat famously has been named after how many rings he has from his coaching career. After a decent time of not renaming his beloved vessel, Bill has been busy the past few years, renaming his boat 3 different times in the past 5 years. The newly named "VIII Rings" is now ready to embark on its new journey out in the seas, until it is renamed again that is. Belichick has won 6 Super Bowls with the Patriots and his other 2 come from his time as a defensive coordinator with the Giants in the '86 and '90 seasons. Lets hope that "VIII Rings" is able to get a new paint job soon and get those numbers to continue climbing up.